Real Housewives of Atlanta star with her Kenyans husband Gerald Mwangi. 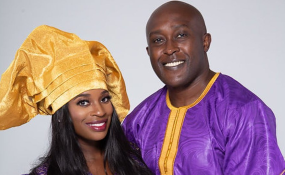 American actress Shamea Morton of the reality TV show The Real Housewives of Atlanta (RHOA) has given birth to a baby daughter Shya Nyambura Mwangi. Shamea, who is married to a Kenyan Gerald Mwangi, announced on her Instagram that she welcomed baby Shya Nyambura Mwangi on November 25th, 2018. "Hello World! Meet... Shya Nyambura Mwangi Born: 11/25-2018 Time: 9:38am Weight: 6lbs 9oz... ," posted Shamea on her Instagram account. A resident of Atlanta, Georgia, Shamea regularly guest-appears on the reality show The Real Housewives of Atlanta (RHOA) on Bravo TV. She currently works as the Atlanta Hawks in-game host as well as a radio personality for a local station. Porsha Williams was there for her BFF Shamea during her pregnancy, and now she cannot be happier after Shamea gave birth to a beautiful baby. She shared a photo with Shamea, and baby Shya on her Instagram account and fans are in awe. The TV personality and the businessman tied the knot in an invite-only marriage ceremony held at a church in Nanyuki, followed by a reception at The Fairmont Hotel. Shamea first broke the news of her pregnancy during her 36th birthday party held at Sage Woodfire Tavern Perimeter in Atlanta on May 13, 2018.